Environmental noise control sound limiter, standard unit. Enables venue operators to regulate noise levels to meet local authorities requirements. The Formula Sound Sentry MKII usually controls mains power via a relay or contactor (Contactor Not Included - Available Separately - Click Here For Details). Unit features a large bar graph display with Linear, C or Bass weighting options. The Formula Sound Sentry Mk2 is the second generation of this product offering more facilities than the original Sentry. The Sentry Mk2 incorporates a measuring microphone inside the unit making it virtually tamperproof. Provision is made to connect an external microphone if required. A large illuminated bargraph display is incorporated into the unit. The unit should be installed in a position where it can be clearly seen so the artiste has full knowledge of the levels at which he is working. If the noise level drives the display to full scale, which is all the green, amber and red lights lit, after a period of time the power will be turned off. The time period is adjustable between 10 to 70 seconds. Power can only be restored manually by pressing a reset button. The Sentry is used in conjunction with a contactor or relay usually to control mains power. The connection between the two is at low voltage so the contactor can be located in a fuse cupboard and wired to control all the sockets in the vicinity. (Contactor Not Included - Available Separately - Click Here For Details). 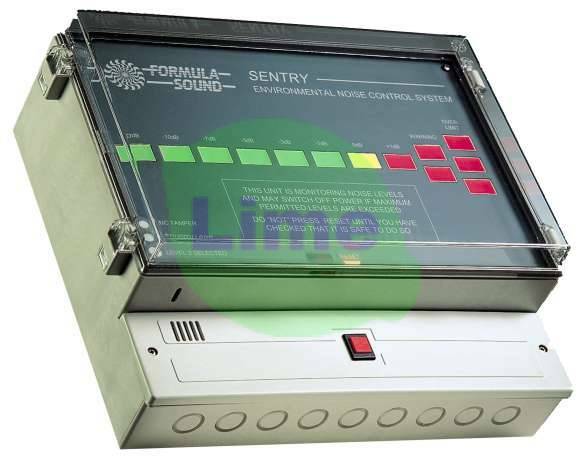 The Formula Sound Sentry Mk2 also has provision to operate at two different levels, which may be selected remotely or by switches operated by open doors and windows, or an optional time switch. This allows the unit to cater for changes in noise type (e.g. disco or live music) or changes in surroundings (e.g. a venue situated near offices requiring stricter control during office hours.) An integral timer which automatically switches between the two sound levels is available as an optional extra. A counter which is not resetable is also offered as an option. The counter records the number of times the unit has been reset. The Sentry when supplied for entertainment venues can be internally selected to work on a linear or 'C' scale or on Bass. This should be used where Bass, i.e. low frequency noise is the problem. When this option is selected a 300Hz low pass filter with a 12dB per octave slope is inserted in the measuring circuit.